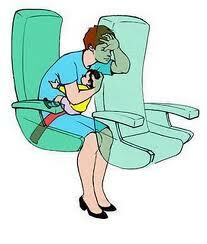 Is Your Baby Safe Flying? The Federal Aviation Administration’s (FAA) position on mandatory child restraint systems (CRS) on planes is, that they’re not necessary. Child restraint systems is “gov-speak” for seat belts. Any why does the FAA think they’re not necessary? They contend that air travel is safer than car travel, where, by the way, seat belts are required. So, they reason, forcing parents to strap their their kids in on a plane, thus having to pay for an extra seat, would cause families not to fly, and to drive instead. Therefore, the FAA argues, a mandatory CRS law would “inadvertently” be endangering these family travelers, putting them at risk by putting them on the road. At this point, an under 2-year-old child, held in a parent’s lap, can fly free. But anyone who thinks a “held child” is safe from an emergency stop in a plane, or turbulence, is playing with their child’s life. The National Transportation Safety Board’s (NTSB) conference on the subject in Washington pushed for a rule requiring all passengers, including infants, to be strapped in in a separate seat. But the Federal Aviation Administration held fast to its contention that children 2-years and younger can fly unrestrained — if they are held in a parent’s lap. Parents can not buckle their child in with them. MSNBC reported that many safety experts at the hearing were very disappointed in the FAA’s ruling. The web site cited former flight attendant, Jan Brown (United Airlines), who was involved in a crash where 111 people died, including children. Would having the children buckled in have made a difference? Not sure, but Brown said she had nothing to offer the “lap children” during the emergency, except to put them on the floor and have an adult hold them in place as the plane prepared for the crash. “A pet carrier would have been safer,” she said. The NTSB is charged with investigating civil transportation accidents and making travel safer. While the FAA agrees with the NTSB’s position, stating that the safest place “for your little one is an approved child-restraint system (CRS) and not on your lap,” it continually stumbles over the absurd car vs plane issue. MSNBC quoted FAA spokesperson, Alison Duquette, as repeating the canard that forcing parents to buy a ticket to use a seat with a restraint will force them to opt to drive, a less safe method of travel. But others argue that the extra cost is far outweighed by the real risk of not strapping a child in a child restraint system. Would you pay the extra money to buy your child a separate seat and buckle up? Next Article Next Article The Chaos of Travel: Who Can Help?